Portable air conditioners can provide relief from the heat -- but they also have some drawbacks. 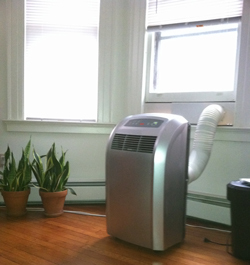 Portable air conditioners are the solution for many homeowners looking for a low cost air conditioning option. While window units are the most common choice, single room air conditioning units like the one shown here are also available. While there are some positives to these units, there are also quite a few issues as well. Dr. Energy Saver can help you understand the pros and cons of all types of air conditioning systems and install the right system for your needs in your home. Call your local Dr. Energy Saver dealer today to get started with an estimate! Whether you're using a window or portable air conditioner, you're sacrificing efficiency. These models simply aren't as effective as other AC systems, and in the long run they will cost you money despite their lower initial price point. Dr. Energy Saver can provide you with a modern air conditioning system that gives you the comfort and efficiency you want in your home. If your home already has existing ductwork for your heating system, installing a central air conditioning system could be a great option for your home. If not, a ductless mini-split system would provide you with a more effective and efficient air conditioning system than portable AC. Your Dr. Energy Saver dealer can help you determine the best option for your home. If you're tired of dealing with uncomfortably hot rooms in your home, call Dr. Energy Saver today to get started on your air conditioning upgrade. Whether you need central air conditioning, a ductless AC system, or repair and maintenance, we can help. Contact your local Dr. Energy Saver to get started with an evaluation and estimate!